The Great American Scrapbook Convention is back in Arlington! 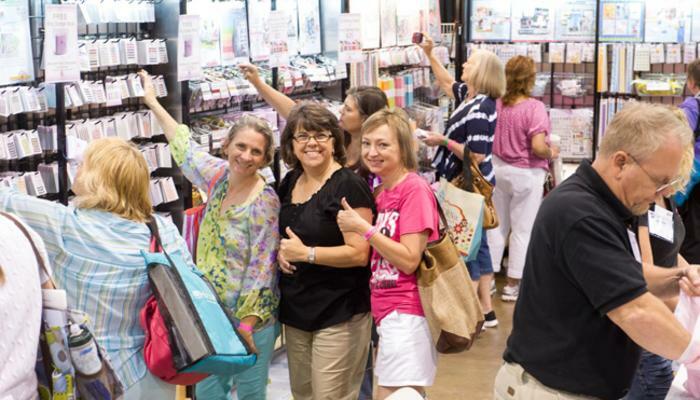 The Great American Scrapbook Convention is headed back to the Arlington Convention Center, June 18th – 20th! This year, they’re bringing the hottest vendors, new education classes, fun prizes to win at the crops, a “Scoops Embellishment Bar” hosted by Queen & Co, swag bags full of product form the best brands, and SO MUCH MORE. Shopping – on Thursday, Friday & Saturday there will be a Vendor Shopping Faire packed with scrap-tastic vendors including SEI, Quick Quotes, Heartfelt Creations, Stamper’s Anonymous (and Tim Holtz!) and many others. You can shop &apos;til you drop from 10 AM – 6 PM on Thursday, 9 AM – 6 PM on Friday, and 9 AM – 5 PM on Saturday. Want to get in before the rest of the crowd for special deals and make and takes? Purchase an Early Entry Ticket to shop at 9 AM on Thursday – you’ll get in an hour before the rest of the crowd! Learning – taught by the industry’s top experts, these hands-on classes are super fun! You’ll learn the newest crafty techniques and have the chance to play with the latest products. PLUS, you’ll leave each class with a whole bunch of loot and inspiration to keep you crafting all year long. Cropping - The Thursday, Friday, and Saturday crops are the PERFECT opportunity for you to gather your girlfriends, scrapbooking tools, and photos to complete unfinished projects or start new projects while having a great time! Games, prizes, product demos, and more are offered for a scrapping good time. And, remember that Embellishment Bar we mentioned before? Join Queen & Co. on Friday night at the Friday Night Red Carpet Crop to get a “taste” of all their fun embellishments! Now that you have a good sense of the fun, check out their website to learn more about the event. You wont regret spending the weekend crafting, especially if you gather your best friends to enjoy it with you.